I recently tried something new - something about which I want to be transparent. IF you follow me on Facebook, this is directly relevant to you. If you do not, I'd still appreciate your voice in this conversation - it is one that goes beyond Facebook. As part of this expansion of breath, I tried a little experiment on Facebook. I joined with others outside of my current circles to share one another's pages and photos. I share theirs, they share mine - we both get new exposure. However, I am sharing pages that are not ones I've shared before (quote pages, travel photo pages, etc.). AND, I'm sharing on a more frequent basis - 5-8 times per day instead of the usual 2-4. 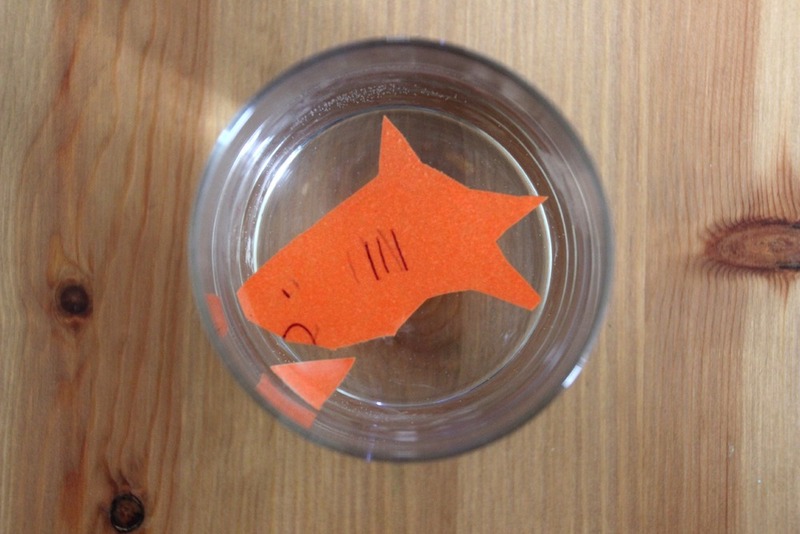 A "paper-fish-in-water" experiment that my kids tried that had....unexpected....results. As this was an experiment, I watched the numbers closely. And for the first time, I had unsubscribes from the BeingBreath FB page. Now, I get it. I know that as a business starts to grow, part of the price I pay is not pleasing everyone. I'm totally ok with that. What I am NOT ok with is being out of alignment with my values - nor with anyone else feeling that I am (i.e. that I'm selling out). What I am doing is walking closer to the cliff edge. There's staying way back in the forest, quiet, non-intrusive. That is where I've been for far too long. I appreciate those who found me there. Then there's going head-first over the cliff - totally selling out. Going for the gusto, for the numbers, the followers. the big bucks. Joining the lemmings as they continue to dive off. Following the same business models that have been financially successful but in all other areas (spiritual, environmental, supporting community) - not sustainable. Photo courtesy of my 9-yr old son who is graciously took this, "I'm listening" shot before racing out the door to play. There are some of us who are trying a new path - a path of a heart-centered business. On this path, integrity comes first. Compassion for others, for self, and recognition of our interdependence always supersedes choices that will lead to more money. It is difficult enough to get to know one's self, to understand one's drive and passions, and to know how to express those things in the world. If we decide to take those things and make them our business - to ask for financial return for what we do - a completely new set of challenges arise. I am not willing to follow the tried-and-true path. Ways of doing business are changing - at least, at a grass-roots level. I am confident that I can both creatively run a business and find success on my own terms. But this means I must be willing to fail. Indeed, that I must fail. That I must try things, blending old ways of doing business with new ways of staying true to my own values (no more of this, "It's only business" BS). Sometimes, I'll walk too close to the cliff. I'll get caught up in the thrilling winds of 6-figure-success and run along with the lemmings. Sometimes, I'll walk too close to the forest. I'll lose myself in fears of sharing, perfectionism, and procrastination. As I mentioned - what is most important to me is not where I'm walking, or what the results might be. What IS important to me is the journey. What is important is that I am acting with integrity - whether I run along the cliff or into the forest. What is important is being honest with YOU. Because, kiddos, that's what BeingBreath is about. As I am more willing to honestly share what I learn through my own awareness, I give you permission to do the same. We acknowledge the awkward. We let those oopses and blatant fails be as prominent in the story we tell as are the triumphs and successes. So, PLEASE - let me know. If you follow me on FB - have the BeingBreath posts over the past 3 days been too much? Have you found them interesting, or irrelevant? Looking from a different perspective than I can, what do you think about the new techniques of sharing-for-sharing? If you don't follow me on FB - what are your thoughts on heart-centered business? If you run a business, do you struggle with staying true-to-yourself vs. bringing in the bucks? This is SUCH an important conversation, with relevance far beyond what I'm doing behind-the-scenes at BeingBreath. Please join me in the comments below and let me know your thoughts.